Students’ ideas often amaze me, and Lydia’s is one of the most suprising examples. She used 7 x 3 = 21 to figure out that 8 x 4 = 32. 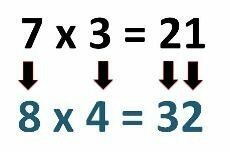 She reasoned that since the factors in 7 x 3 were each 1 less than the factors in 8 x 4, she’d just increase each digit in the answer, changing 21 to 32. She was correct! Read about Lydia’s discovery, what I did, and what I learned. computing, factors, Investigating, Marilyn's Blog, method, Post from Marilyn's Blog: Where's the Math?, strategies, Where's the Math?